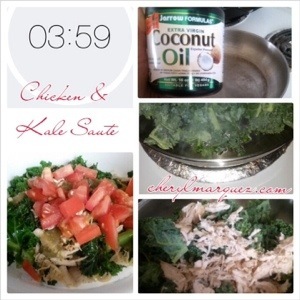 Eating good doesn’t need hours in the kitchen, here’s a 4 minute chicken and kale sauté. During meal prep, I shredded a rotisserie chicken, chopped tomatoes and other veggies and put them in containers. When I need to make a quick breakfast or lunch, I just heat up a pan, add a good fat and sauté meat and veggies. Heat the coconut oil until it’s melted, toss in a couple handfuls of kale, add cracked black pepper, sea salt and minced garlic and saute for about 2 minutes. Next add the shredded chicken and saute for another 2 minutes to heat the chicken. You can replace the chicken with leftover meat you have on hand and swap out the kale for your fav veggie. Enjoy!